Use these prayer poems for encouragement and for reflection. Find prayers written from the heart. Let these verses be ones that encourage and remind you of the power of prayer. 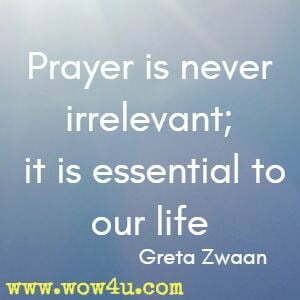 Our prayers are sometimes answered without us realizing or, in ways that we did not ask for but always remember God's plan is better than ours. Prayer in the time of triumph acknowledges God's in control. It's not a crutch which to lean on, or to use in times of strife. Prayer is the essence of morning, the fragrance of life to embrace. In prayer we acknowledge dependence, a place where God and man meet. 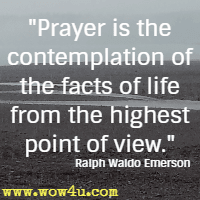 The power of prayer is enriching, uplifting to hear our God speak. But a still small voice known as conscience is God's way of speaking to man. God, in His infinite wisdom, is the source who always prevails. God is a most willing listener and He is eternally there. Let me bow before You without fault. But through Your mercy and Your grace. May I in earnest seek your holy face. My thoughts be ever heaven bound. Before the cross where gently peace is found. And all attractions of the world dismiss. For in Your presence there is peace and bliss. Walk beside me in this journey that I'm on. Whether in the night or in the early dawn. I have come to bare my heart before Your throne. I trust my life to You, to You alone! Do you think God's forgotten? You're out of His sight? You're just a nuisance and He doesn't care. It's out of your league but what do you do? It seems He can't hear you but you don't know why. Your cries an your pleadings God seems to spurn. Oh, how can you reach Him? Why doesn't He hear? Your heart breaks with anguish, you're life's filled with fear. Your tears are all spent, you simply can't cope. "My child, I've been listening, I've always been near. Through testings and trials My ways are still best. Be patient, be trusting, I'm still holding you. That I wasn't with you, that I wasn't here. I hear every cry; I hear you in prayer. Trust Me My child for I'll always be near." We ought not wait till trials arise through illness or through strife. 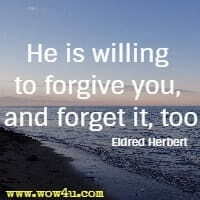 We should not wait till turmoil comes then plead with God again. For constantly He guides our way whatever we may go through. We run for help in deep dismay when we need God to lead. For every breath that comes our way to which our life must cleave. For peace that fills our troubled soul in trials we must face. He hears the cry that each soul makes, their cry for righteous living. Give God the glory for His love and set the joy bells ringing. Do you have a problem that is very hard to bear? Do not wrestle with it; take it to the Lord in prayer. So talk it over with the Lord, He will not neglect. Do you a have a burden that your friends don't know about? Is it something you would rather they would not find out? You will find He is ever present, waiting for you there. They will grow much lighter when you go to Him in prayer. Christ is there to save you, and you will not suffer loss. I asked for in my prayers. And he answered with a hum. And he answered with a wrong. That would make me strong. And he answered with a date. That I was forced to wait. And he answered with throw. That I could get to know. Only that of which I need. With only a single plead. For they that remember God's goodness go singing far into the night. 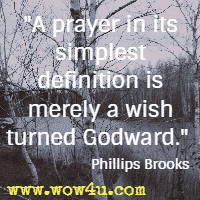 "A prayer in its simplest definition is merely a wish turned Godward." If you want to truly, enjoy your life in full. Living in the moment, is how you'll feel that pull. Living in the moment, is the best thing you can do. Our days are already numbered, and each moment should be true. The moments of each day, are a special gift to us. And should never be wasted, we should feel very blessed. Spend your time wisely, and with people whom you care. And at night when you're thankful, just say a little prayer. Living in the moment, is truly a special sight. Take the moments you've been given, and thank God tonight. You cannot say the Lord's Prayer and even once say "me,"
And the fourth time it's our, and the fourth time it's us. You cannot say the Lord's Prayer and even once say "I,"
You cannot say the Lord's Prayer and once say "my,"
For when you ask for daily bread, you must include thy brother. For from beginning to the end it does not once say "me." 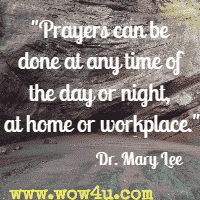 "Prayers can be done at any time of the day or night, at home or workplace." So urgent was your heart to make it known! And cries, "It shall be done" - sometime, somewhere. Lord, You know the great need. But what of the souls in darkness at home? If they don't hear, they won't heed. And trusts in Him no more. And we mustn't blame only the youth. A child in hunger, thin and weak can cause quick tears upon your cheek. You watch the news of foreign fields and shudder at what torture yields. A brutal mess, this can't go on, yet strife prevails from dusk to dawn. The greed of man, the cause of war; won't God step in and say, "NO MORE!?" Yet countless suffer, countless die, while we at home are asking, "Why?" We shake our heads and say, "What a shame," but in all fairness, who's to blame? Did God not lay upon your heart that you indeed must do your part? A land of plenty and to spare, I wonder, do we really care? To others on a foreign shore when you need that and even more. The cost of living grows each day, there's little left of each week's pay. When good times come you'll really give, you'll show you care that they should live. But not just now, at least not much, e'en though their plight your heart might touch. The pangs of hunger from their door that daily greet each child once more? Christ said that inasmuch as ye have done for them, you've done for me. They too are of our human race, they too, in God's plan, have a place. What will you say when God shall ask, "Did you perform your earthly task?" Be mission minded, give or go, let your light shine, let your light glow. Your duty lies to all mankind, the path of life they too must find. And let these feelings fill your soul, let God alone be in control. There's much that you as one can do for missions means both I and you. Become involved, love give and pray. The blessings? Yours! Yes, yours today. and pulls us out of the dumps. get the answers we seek. Teach me to be less self-observant, willing to serve or be spent. Cast away all my own self-importance; to your ideals always be true. Instill in my heart a heavenly longing and the lures of this life to distain. Bring to my thoughts why I've been created, show me in whom I must trust. Bless me with a true understanding, guide me to walk in Your chosen way. Full of great splendour, awesome in colour, majestic in glory, in pure harmony. Then, only then, can I follow Your footsteps, thereby to serve You all my life long. Free? Free? Am I Really Free? I rarely fear for life or limb. The evening lights will not grow dim. I vote for whomever I think is best. I live in a country that's truly been blessed. To worship or not is all my own choice. What more can one ask from such a vast country? Where each individual's been given a voice. Truly! That's freedom! What more could one ask? Able to purchase all I desire. There's nothing that money cannot acquire. So, why am I then not totally happy? What causes this void that I feel deep inside? Nothing I want to me is denied. Something to give my life a new goal. Have no way of filling the void in my soul? If I could relinquish my need for success? "You need not succumb to this terrible distress?" There's no other option, I must find renewal. I cannot continue to live with despair. Surely there must be a new way somewhere. Please! For the sake of my desperate soul! Before I hit bottom, and lose all control. The shield of indifference; it's only a ploy. Listen! And hear the soul's cry within me. Remove all the heartaches and teach me of joy. I doubt that I'm meant to wander, to stray. I've shown my dilemma, and now, you must help me! I plead with you! Please! Help me today!